Legitimate Havaianas’ design was inspired in a typical Japanese sandal, called Zori: footwear composed by a thin sole made of rice straw and fabric stripes. In 1962, São Paulo Alpargatas used rubber as raw material and adapted the Japanese sandal to the Brazilian market. The rice grain shape was used for the sock liner texture, referring to its inspiration. A curiosity! When Havaianas were already a success, many people started to copy them. Thus, Havaianas’ advertisements reminded consumers that they should not accept the fake sandals, only the legitimate ones. Since everybody was always saying the word “fajuta” (fake), it was included in Aurélio’s dictionary, as a synonym of fake and poor quality product. In the early 90’s, consumers imposed fashion by turning the white part of Havaianas downwards and the colorful side upwards, attempting to “create” a one-color sandal. Since such movement, monochrome sandals called Havaianas Top were created, in the colors black, royal blue, purple and pink – initially in 4 colors – nowadays, the Top line has more than 15 different colors available. 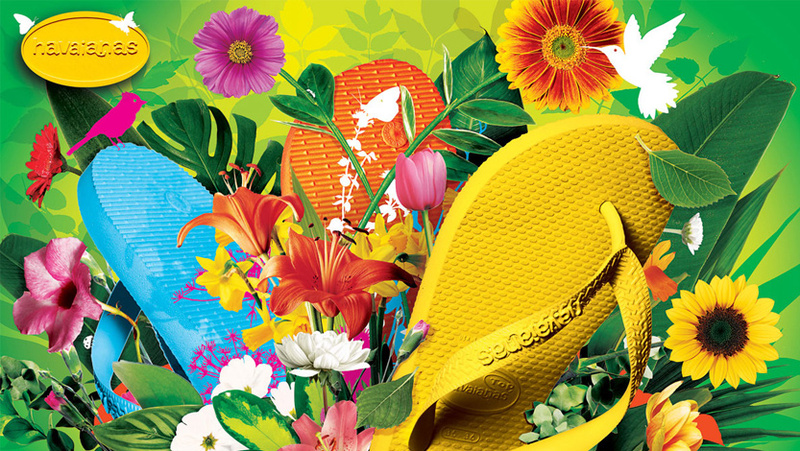 In 2007, the most important stage of the brand international expansion started: Havaianas definitely put its flag in USA, with an office in NY, and in 2008, in Europe, having the headquarters based in Madrid. 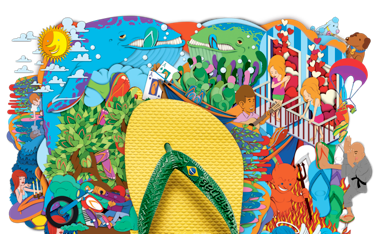 Symbol of the Brazilian good vibe in any part of the world, Havaianas became subject in the pages of important magazines and newspapers worldwide and achieved some of the world’s most wanted display cases. Nowadays, the brand is present in more than 150 thousand points of sale throughout Brazil and exports to more than 80 countries, offering products that go far beyond the classic sandals.